Affordable Omaha Painters - Wyman Painting, LLC. Residential / Commercial Painting Company Omaha Neb. Your home is your castle. Indoors, as years pass, there’s wear and tear. Baseboards, moldings and trim – chip. Nail holes multiply. Color trends evolve. Wyman Painting can renew your space, inside and out for a reasonable rate. For dull and weather-worn exteriors, we’re your go-to crew. Curb appeal, our specialty. Count us. Your residential painting company contractor. “As an Omaha House Painter, my son & I work very hard to do the most precise painting that our customers expect. We like to see our customers happy. We’ll do whatever it takes,” says Chris Wyman, owner of one of the best Omaha painting companies – preferred by realtors, brokers and homeowners alike. Fluctuating Nebraska temps breed mold and mildew. Sporadic hail storms leave pock-marks on decks, fences and exterior surfaces. Before staining, we suggest our power washing services. You need painting contractors who are on time & on budget. 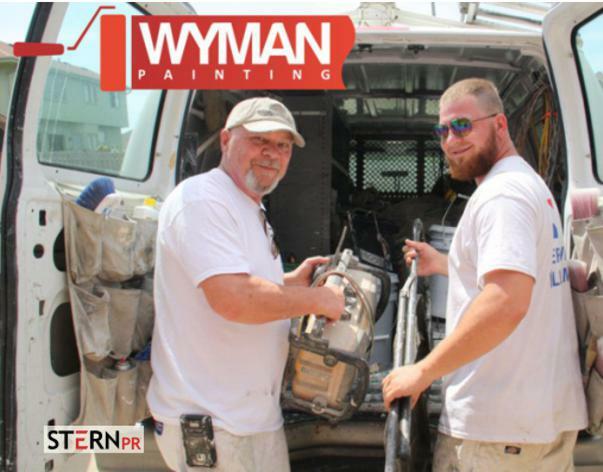 Wyman Painting makes sure the job gets done right—on budget and on schedule for commercial spaces. We meet your deadline, and adapt to change. Reach out to Owner Chris Wyman for an estimate or RFP. Wyman Painting, LLC. carries the credentials your organization expects. Insured. A+ BBB rated. A registered Nebraska painting contractor. Contact Wyman Painting now for a free quote. Inquire by online note. We arrive with smiles. You’ll grin at our workmanship. We Arrive with Smiles. You’ll Grin at our Workmanship! Meet the Crew! Dad Chris. Son Brandon.